In reality, Spain is on the brink of insolvency and under huge pressure to accept a rescue package. In return, the eurozone's fourth largest economy will have to surrender sovereign and financial control to the IMF, the European commission, and the European Central Bank. If talk of a financial coup d'etat sounds far-fetched, consider this statement from a recent Goldman Sachs report: "The more the Spanish administration indulges domestic political interests … the more explicit conditionality is likely to be demanded." That's banker-speak for, "We can do this the easy way, or the hard way." Meanwhile, in his heroic denials that a bailout is even necessary, Spanish prime minister Mariano Rajoy increasingly resembles Saddam Hussein's information minister continuing to insist the Americans were fleeing and killing themselves by the hundreds at the city's gates, even as Baghdad was falling. Rajoy's strategy of denial has form. In June he insisted Spanish banks would not need to be bailed out, two weeks before they were. This paternalistic, old-fashioned attempt to mould public opinion in the face of reality seems to indicate that, as many local commentators have observed, the Spanish administration is operating "as if it didn't know the internet existed". Maintaining the illusion of sovereignty is important, because Rajoy does not want to go down in history as the author of Spain's humiliation. There is an infamous picture of Indonesia's President Suharto signing away economic control in 1998, as the head of the IMF looms over him, arms folded, smiling. Rajoy is desperate to avoid such a scene, all too aware that the governments of Greece, Portugal and Ireland fell after being forced to ask for bailouts that imposed further austerity on their populations. The PP also wants to avoid asking for a rescue package before crucial elections in Galicia and the Basque country on 21 October. But if Rajoy further delays in asking for a rescue, he could suffer the same fate as Berlusconi, removed from power last year and replaced by a an ex-Goldman Sachs technocrat after a run-in with the European Central Bank. The main problem for Rajoy is that what Goldman Sachs calls "indulging domestic political interests" the rest of us call "democracy". The government is right to fear the Spanish public's reaction to this new round of suffering mandated by the financial markets. Already many protest signs say: "We can't take any more." With a 26% unemployment rate, 22% of Spanish households now live below the poverty line and a further 30% cannot "reach the end of the month" as they say here. 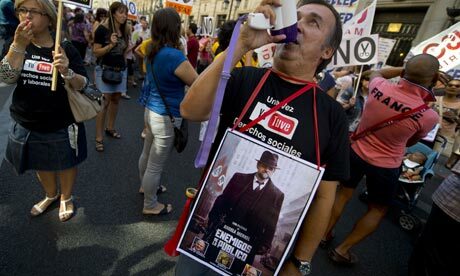 Hundreds of thousands of trade unionists took to the streets of Madrid again last week. Loss of sovereignty is fuelling desire for Catalan independence with huge protests. Spanish citizen movements, like those in Greece, Ireland, Portugal, Italy and France have demanded a debt audit, to see who really owes what to whom. Opposition politician Cayo Lara is asking for any bailout conditions to be debated in parliament, while a group called Judges for Democracy are looking at whether the virtual deconstruction of the social state could be unconstitutional. And the Spanish indignados are rattling the gates of Congress today against the betrayal of political parties and the undermining of popular democracy by the troika and the markets. They are up against some of the most powerful forces on the planet. But they may take comfort from their counterparts in Portugal. Recently the Portuguese government announced it would raise social security contributions from 11% to 18% in a country which cannot absorb more salary cuts. In response an unprecedented 600,000 people swarmed the gates of parliament and 40 city centres across the country, shouting "thieves!" and "cowards!" and demanding the government's resignation. In response the Portuguese government has done a U-turn. Goldman Sachs and their ilk will find Spaniards at least as fiery in defence of their sovereignty.